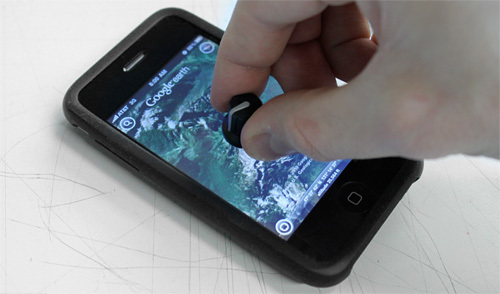 Clever 'Hack' Provides A Physical Knob Interface For The iPhone | OhGizmo! I’ve got nothing against touchscreens, they’re great for most applications, but they’re not always the ideal alternative to a physical button, slider, knob or even scroll wheel. So I like this clever compromise that dsLabs have come up with. Using the same principles people have used to create capacitive touchscreen-friendly styluses, they’ve created a touchscreen-friendly knob that allows you to rotate objects on the iPhone/iPod Touch/iPad by rotating the knob while it’s sitting on the screen. And making your own doesn’t seem to be that difficult. It just requires a bit of trial and error and some extra care to ensure the knob you’ve re-appropriated doesn’t scratch up the display.